Still to fly on an Embraer 175 and an earlier generation Embraer 135 and 145. Originair would like to advise that due to future planning considerations the company will be working with Air2there on Nelson to Palmerston North services from the 23rd September. Flights will proceed as planned by services provided to Originair by Air2there, using a twin engine aircraft, until Jetstream operations commence. Piper PA31-350 Chieftain ZK-VIP operated Originair's services on 23 September and it flew Paraparaumu to Nelson before flying the Nelson-Palmerston North-Nelson Originair service before returning to Paraparaumu using air2there callsigns. In Auckland BAe Jetstream 32 ZK-ECI has been sitting in the hangar here on jacks for a number of days but was rolled out on the 22nd of September and is now sitting at Auckland airport. Originair winged back into Palmerston North on Friday afternoon, reviving a regular service between the city and Nelson after a five-month break. The small airline began flying between the two centres in August 2015 after Air New Zealand had withdrawn its service earlier in the year. But the airline was grounded in April when the Civil Aviation Authority placed temporary restrictions stopping Air Freight NZ Ltd from operating Originair's planes. As the link resumed, a small nine-seater aircraft operated by Air2There would be flying the route for Originair. The larger Jetstream would move back into service within a few months. Originair managing director Robert Inglis said he could not be more pleased about the timing of the return of the service this weekend. "If it had been last weekend, we would not have got off the ground, as Nelson Airport was closed by weather last Friday and Saturday." Originair had not been a complete stranger to Palmerston North during the break, providing some charter services. He said the plan was to slowly start building up the service to higher frequency during the high summer season. "The support is stronger for the Friday to Sunday market at the moment, but we will start to build the schedule." Inglis said so far there was good support for seats on the flights in both directions. Palmerston North Airport chief executive David Lanham said it was good to see another route restored. He said the schedule was initially targeted toward a seasonal, leisure market, and he hoped it would be extended to cater for the business market. "It is a really welcome return of a connection that proved very popular. "Robert Inglis and his team have been working really hard to get this far. It's hard for the little guys out there, and we really hope they can consolidate and grow." The initial schedule would see Originair flying from Nelson to Palmerston North on Monday and Wednesday early in the morning, and mid-afternoon on Fridays and Sundays. The aircraft would return from Palmerston North to Nelson on Monday and Wednesday mornings, Friday and Sunday afternoons. Originair resumes services on Friday the 23rd of September. The airline will operate four flights a week between Nelson and Palmerston North. I hope they are able to rebuild their service and develop a decent timetable between the two centres. Air New Zealand is happy with regional demand of flights between Timaru and the capital. The airline replaced its 19-seat Beech aircraft with 50-seat Q300 aircraft on routes between Timaru and Wellington in April this year. However, daily commuter return flights between Wellington and Timaru have been reduced to one from December 25 to January 8 because of low demand. In an emailed statement, a spokesperson for the airline said it would not release loading (seating) information on the route because it was commercially sensitive. Load factors varied from route to route, "but Air New Zealand is happy with current demand on our regional network". Senior economist Benje Patterson, of Infometrics, said Air New Zealand needed to fill, on average, 80 per cent of its seats to get a good level of profit. "Domestically it averages at 80 per cent ... We know they're getting good profits at that. "If it's dropping substantially below that, you have got to question if they are getting a substantial return to continue to fly it." Patterson said it was normal for airlines to balance its schedules to make sure it was making a return, and in Timaru's case, it was predominately catered to a "business market". "Planes are very expensive assets. You need to see a return." Patterson said moving from the 19-seater to the 50-seater aircraft was part of a change in focus for the airline nationally, moving to mid-sized turbo prop aircraft from "pencil" planes. "Air New Zealand in the past has obviously reconfigured its regional network, making sure it [was] meeting customer demand and getting optimal return out of [its] fleet," he said. The airline would give the route a "bit of time" before deciding upon any changes, which would be well-signalled ahead of time. The last round of regional restructure gave several months warning, giving plenty of other smaller airlines to "fill the void". Federated Farmers national president Dr William Rolleston said he used the service once or twice a week regularly, and said he did a head count of people on each flight. Rolleston said he could remember only one flight where there were about 20 people on it. They were "consistently" fuller compared to the smaller planes, he said. "So it gives me the impression more people are going through than they were before [the new airplanes were put into service]. They never ran out of car parks before until the new service came in." Rolleston had no issue with the airline cancelling flights during the holidays, especially if it meant tickets were less expensive throughout the year as a result, he said. Incumbent mayor Damon Odey said the service was well supported and noted the "tripling" of cars parking at the airport, including some parking on the grass. Odey said he noticed flights on the weekend were also full when he used the service. "I believe there's good demand there." The introduction of the 50-seater planes had also reduced the costs of tickets significantly which was a benefit to the district, he said. Mayoral candidate Phil Smith said Air New Zealand's response was a broad statement and was not specific enough. Smith said the real focus should be whether the Timaru airport was being utilised right as a resource to help local businesses grow. Thanks to Josh who sent these photos of Sunair Aztecs ZK-FVP and ZK-PIX at Whangarei on 6 September 2016... Last week the Aztecs were used to fly between Whangarei and Kaitaia, up in the morning and back late afternoon so I am assuming Sunair is now flying the doctors service to Kaitaia for the local Health Board instead of Barrier... It looks as if Barrier Air stopped operating their Auckland-Whangarei-Kaitaia service in mid August. Barrier Air still operates a Sunday to Friday Auckland-Kaitaia and a Monday to Friday Kaitaia to Auckland service. In 1934, however, there was no road to Haast. Supplies came by the monthly shipping service from Hokitika or by pack-horse, a four day journey south. The isolation of the region and its scenic beauty needed an aviation-minded man with a pioneering and entrepreneurial spirit. Flight-Lieutenant J C (Bert) Mercer was that man who was to form Air Travel (NZ) Ltd, New Zealand’s first airline. Mr H. W. Worrall, of Christchurch, was chairman of directors of the new company, Mr A O Wilkinson, also of Christchurch, was the secretary, and Captain J C Mercer managing director. The other two directors were Messrs Paul E H Renton and H Newman, of Hokitika, the latter being the managing director of Newman's Motors Ltd which ran motor services on the West Coast. 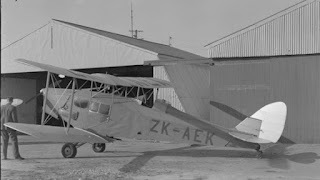 Air Travel (NZ) took delivery of de Havilland DH83 Fox Moth, ZK-ADI in December 1934 as it prepared to commence a new passenger and air mail service. Based in Hokitika the company planned to inaugurate services stretching from Inchbonnie, a small West Coast locality on the Midland railway line between Otira and Moana, to the Glaciers and to Haast and Okuru in South Westland. The Transport Co-ordination Board heard the company’s application for a licence on the 30th of November 1934. Both West Coast Airways Ltd and NZ Airways Ltd objected to the granting of the licence. Bert Mercer was no stranger to flying on the West Coast and he submitted that in view of his aviation record and the fact that his company had secured the mail contract it was entitled to the licence. The Board’s decision was reserved as two other applications for air services on the West Coast were pending. It was subsequently announced that the Transport Co-ordination Board ”was of opinion that the application should not be determined finally until the other applications, including the company's application for an air taxi licence radiating from Hokitika, could be heard.” Nonetheless, as the company was ready to commence services, the Board decided to license the service for a short period, and at a later date to consider the three applications together. Accordingly, a licence was granted for a period of three months with leave granted for the licence period to be extended. 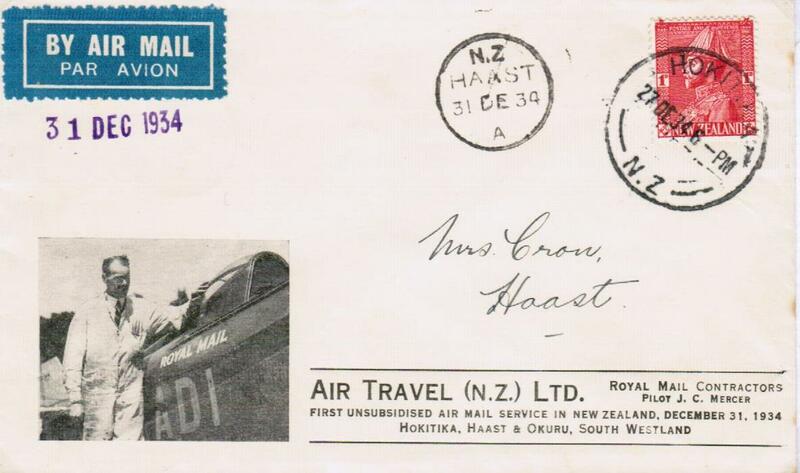 The mail contract to Haast and Okuru was quite unique as it was to be the first regular air mail service in New Zealand, and one of only two or three in the world in which no surcharge was made for air transport. The contract envisaged that mails would be carried once a fortnight. 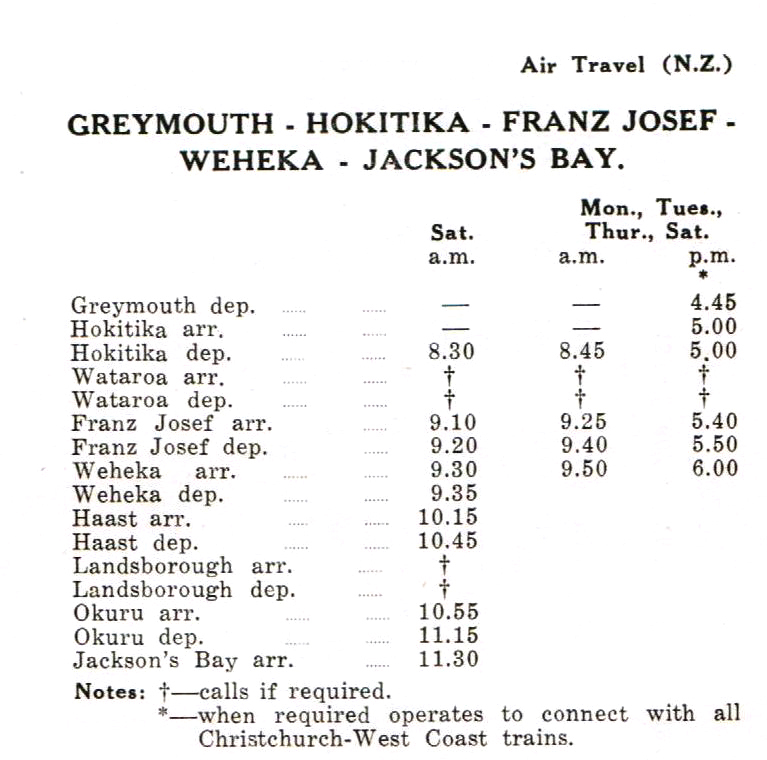 The mail would leave Hokitika at 8.00am on alternate Mondays and the return flight would be back at Hokitika by 4.00pm. Before the advent of the air service mails took four days to get through to Haast - a day to Fox Glacier by service car and three days from there by pack-horse. Flooding in the South Westland rivers and creeks sometimes lengthened the delivery time. The Air Travel (NZ) service reduced the mail delivery time from four days to an hour and a half! While the mail contract was set to begin on the 31st of December 1934 the company announced that its services would commence on the 18th of December. Arrangements were made with the Railway Department for South Westland passengers to alight from the West Coast express at Inchbonnie and fly from there to the Glaciers. Newspaper reporting announced that although the machine has accommodation for four passengers, it is intended, until some of the landing grounds on the route are extended, to carry only two passengers and baggage, so that it is expected that sometimes two flights will have to be made from Inchbonnie to the Glaciers, and two from Hokitika, on one day… People who leave Christchurch in the morning and fly from Inchbonnie will be at the glaciers for afternoon tea the same day. Whereas at present it takes four days' travelling to get to the glaciers and back, with the air service only two days will be necessary. In preparation for the commencement of the services Mr E A Gibson, the Government aerodrome engineer, inspected and reported on all the aerodromes on the route, some of which were still under development. The company planned to use 14 airstrips/landing grounds at Westport, Hokitika, Greymouth, Ross, Wataroa (Whataroa), Waiho (Franz Josef), Weheka (Fox Glacier), Karangarua, Jacob’s River, Bruce Bay, Haast, Okuru and Upper Okuru. Landing grounds were also to be improved at Arawata and Landsborough. In the early 1930s Bert Mercer had been flying the Canterbury Aero Club's aircraft in South Westland. A number of South Westland residents had already seen the benefits aircraft could bring in the time and had already made their own airstrips. 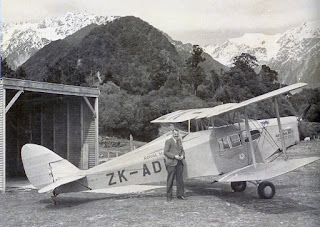 Air Travel (NZ)’s Fox Moth, ZK-ADI, arrived at Hokitika on the 15th of December 1934. The Christchurch Press carried a report on Air Travel (NZ)’s inaugural service which was operated on the 18th of December 1934. Two passengers, Messrs H. Worrall and G. H. Christie, left Christchurch by the 10 o'clock express yesterday and arrived at Inchbonnie at 2.55pm The aeroplane left Inchbonnie at 3.20pm and arrived at Hokitika aerodrome at 3.40pm The machine left Hokitika at 3.55pm and after flying over the glacier, arrived at the hostel at Franz Josef at 4.50pm Afternoon tea was taken at the hostel, and the machine left at 5.35pm, arriving at Inchbonnie at 6.30pm, connecting with the 7pm train east. The trip was an excellent one in every way, the machine proving particularly comfortable, and one of the passengers, with hardly any previous experience, enjoyed the sensation of flying perfectly. From the point of view of scenic attraction the trip is without parallel in New Zealand. On Monday the 31st of December 1934 Air Travel (NZ) commenced its fortnightly air mail service from Hokitika to Haast and Okuru. This marked the end of the pack horse mail service with all mail taken by air. The Press records the day. The significance of the inaugural flight was not lost on the people of Hokitika and when Mr Mercer arrived back from the south he was met by a large crowd at the Hokitika aerodrome and warmly congratulated as the pioneer of regular aviation in the south. A formal function was held after arrival, and the company connected with the service was thanked for its enterprise. The aeroplane which made this historic flight returned with two passengers, Mr and Mrs J. Cron, South Westland residents who have themselves been pioneers as air travellers in that district and who on Monday made in a few hours a journey which only a few years ago usually occupied them six days. Mr and Mrs Cron and their family have made frequent use recently of aeroplanes for travel to and from the far south and have constructed a landing ground practically at their own back door. They received hearty congratulations as the first passengers to travel with the air mail. The aeroplane carried a fairly heavy mail both ways but many hundreds of the letters carried were those sent by stamp collectors and enthusiasts who wished to own one of the original covers used on such an important occasion. The ordinary official mail down to the Haast consisted of approximately 200 letters and there was a heavy official mail for the return trip. The weather was cloudy and misty with light rain falling for most of the journey down and up. The chairman of the Westland County Council (Mr T. R. Chesterman) was the principal speaker at the aerodrome. He congratulated all connected with starting the mail service, and mentioned that he recollected life in the early days in South Westland, when it seemed to take months for news to penetrate there from the outside world. Aeroplanes had removed the hardships attendant on such isolation. No doubt good use would be made of the service. Mr Chesterman said, and he himself intended to approach the Postmaster-General to try to have it made weekly instead of fortnightly. On behalf of the county of Westland he congratulated Mr Mercer and his company on their enterprise. He hoped that the service was here to stay. "Westland is fortunate in having here a man as enterprising as Mr Mercer," said Mr Robertson, the chief postmaster for the district. It was a big jump from the packhorse to the air mail. Mr Robertson complimented the people of Hokitika on their air-mindedness. The Mayor of Hokitika, Mr G. A. Perry, said that in the old days of the gold rushes it used to take miners three or four weeks to get to Okuru. Now it could be done in a few hours. The service would be of great value to travellers and would probably become an absolute necessity, so much so that it would become automatically a weekly service. "The West Coast people seem to I have become much more air-minded I than the people in any other district in New Zealand, for its size and population," said Mr T. E. Y. Seddon, who recalled the difficulties which were met with when tracks had to be made for mail carriers to the far south, before the advent of faster services. Mr Seddon paid a tribute to the enterprise of intrepid Westlanders who had assisted in pioneering the mail service and the passenger service. Mr J. A. Murdoch, "another speaker, described Mrs Cron as the New Zealand "Amy Mollison." He said that the province owed a great debt to people like the Renton family, Mr A. H. Nancekivell, Mr H. T. Parry and others who had done so much to assist in establishing aviation on the coast. "It has always been my desire to advance aviation if I can in New Zealand" said Mr Mercer when asked to reply "I realised some years ago that aviation might be of help to the settlers of South Westland." Mr Mercer congratulated and thanked the people of Hokitika for making the air mail venture possible by forming an aerodrome. It was his intention, he said, to stay on the coast and do as much as he could to further the development of aviation. Mr W. Searle, a member of the Westland County Council, also spoke, mentioning the rapid advance made in transport in the last 20 years. In early February 1935 the Transport Co-ordination Board granted Air Travel (NZ) a licence to carry out a service on the West Coast as well as an air taxi licence to any part of New Zealand commencing from or terminating at any of the aerodromes or landing grounds on the applicant's route. Both licences were for a term of five years. From an early stage charter flights of various forms formed an important aspect of Air Travel (NZ)’s business. 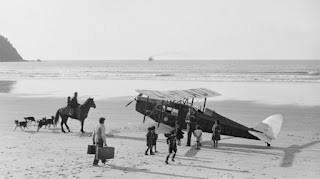 On the 26th of January 1935 Captain Mercer made an ambulance flight Bruce Bay, to bring out to civilisation a Maori child who has been ailing for some time… He landed on the beach near a new sawmill which is being constructed there. The sick child, with its mother, had been waiting there for the arrival of the aeroplane, having first had to cross the river on horseback to reach the bay. The child was in Hokitika to a doctor in less than two hours after leaving Bruce Bay, making in that short time a journey which in ordinary circumstances might have taken three days. Mr Mercer returned with a woman passenger to Waiho and picked up Mr A. O. Wilkinson (Christchurch), secretary to Air Travel (NZ), Ltd., with whom he made a record flight back to Hokitika in 35 minutes, beating the previous record by a few minutes. By car, it takes the best part of a day to do the same trip. The journey up was in fine weather, with the conditions fairly smooth. After dropping a woman passenger at Hokitika, the aeroplane left with Mr Wilkinson to connect with the express to Christchurch at Inchbonnie. The Evening Post reported on a charter flight from Hokitika to Nelson and Wellington on the 5th of February 1935. On other occasions the Air Travel Fox Moth flew trampers, hunters and prospectors to the back blocks of South Westland. Another feature of the company’s activities was to become scenic flights over the glaciers. The Press on the 9th of January 1935 carried coverage of the first such flight from Fox Glacier “over the roof of New Zealand.” During the holidays Mr W. E. Simes, of Christchurch, and Miss D. Wright, of Melbourne, made the first aeroplane flight from the recently completed landing place at Weheka, about two miles from the Fox Glacier Hotel. The pilot was Mr J. C. Mercer, of Air Travel (NZ), Ltd., and the machine was a Fox Moth. The two passengers were in the air for three-quarters of an hour, and the machine reached a height of about 10,000 feet. Miss Wright had flown in Australia, but this trip was her first flight in New Zealand. Both passengers greatly enjoyed the trip, and Mr Simes told a representative of "The Press" yesterday that there was every likelihood of similar flights "over the roof of New Zealand" proving popular with visitors to the Fox Glacier region Describing the trip on Christmas Day, Mr Simes said that it was the second time that Mr Mercer had landed there. The runway of 21 chains was in excellent condition. He considers that aviators will be able to land in all weathers. An exceptionally good view of the Southern Alps was obtained, including Mounts Cook, La Perouse, Dampier, Tasman, Lindenfeldt, Haast, Hardinger, Douglas, and the glacial peak at the head of the Fox glacier. On their right they had the Copeland range and valley, the Sierra range, Mount Sefton, and the head of the Sierra range- on their left was the Cook river canyon with the La Perouse and the Balfour glaciers at the head of it, and the Balfour river flowing into the Cook river. They then flew along the foot of the range, and obtained a view of the same peaks. The flight was continued along the neve of the Fox Glacier to the Kaiser Fritz range, crossing the Waikukupa valley to the Victoria range. Here they obtained a wonderful view of Lakes Mueller, Lyttle, Mathieson, and lanthe, also of many miles of the forest-clad West Coast, and of 40 or 50 miles out on the Tasman Sea. "In my opinion," Mr Simes said, "this is the best, scenery in New Zealand as it is the roof of New Zealand. Our trip showed the possibilities of enjoyment by those unable to climb; it also affords opportunities for those who wish to make a continuous southern trip. Within weeks of commencing operations Air Travel (NZ) was changing the face of South Westland. A Press reporter recorded the development of the airline on the 30th of January 1935. A month ago a young Christchurch man, a prospector, left Hokitika to travel by motor, by packhorse and on foot to Okuru, in South Westland. It took him three weeks to get there. He suffered delays and privations unbelievable. On Monday he left Okuru at 1.30pm and was in Hokitika at 4pm, after making three stops on the way. On the second occasion he travelled the 170 miles by aeroplane. And every week scores of men and women are following his example and using the same aeroplane to annihilate distance and break down in that short journey the terrible isolation which has been the drawback to life in the south for 60 years. This aeroplane is the new pioneer of South Westland. The hardy settlers, inured to long journeys along pack-tracks on sturdy horses, to uncertainty of supplies and assistance in times of illness, have hailed the newcomer with delight and all the help they can give. The aeroplane has opened up a new life for them, they claim, and is doing a service the value of which cannot be measured in money or expressed in mere words. This is the personal boon which the enterprise of Air Travel (NZ), Ltd., has brought to the people of South Westland. There are the material advantages or regular mail deliveries, quick transport in and out in the case of accident and for everyday purposes, regular arrival of the day's news and business information and close contact with the isolated settlements which stretch adventurously down the coast. A reporter from "The Press" was taken by air to visit some of these settlers on Monday and at every farmhouse where the aeroplane landed men and women spoke, some with deep feeling, of their long years of semi-isolation, their weeks of being alone without knowledge of the outside world and their fear of illness without assistance. They spoke of bad roads, impassable in flood time, week-long journeys on horses, with enforced stops on the banks of flooded rivers. But with the keenest enthusiasm they recalled the arrival of the first aeroplane and the vanishing, overnight, of their isolation. On the journey down on Monday, wherever mail had to be delivered or papers dropped from the aeroplane, each house had the entire family, down to the dogs, assembled in the home paddock. There was exuberant gesticulating and waving. While one of the sons or the lady of the house ran excitedly for the paper as it floated down, the others cheered. In the smaller settlements the entire population was out as the aeroplane flew at a low altitude and the pilot (Mr J. C. Mercer) dropped the bundle of papers, and swooped the aeroplane up again. Wherever a stop was made morning tea was ready. Even the long thin line of tourists strung out over the Franz Josef Glacier, hailing the aeroplane as a tangible sign that they had not lost touch with busier civilisation even in that paradise of solitude and beauty, waved ice axes and shouted. Blacksanders. toiling laboriously on the beaches for gold, stopped their work to wave too. With conditions as they were a year ago, and no regular call by aeroplane, these men spent months in complete isolation but for the occasional call of a packhorse with supplies and a mailman. If they left their beaches there was no guarantee that they could return in sufficient time to catch conditions at their best. Blacksanding is subject to every vagary of the tides and the weather and a blacksander must be on the spot if he is to work each fresh deposit of the gold-bearing sand revealed after storms and floods. No wonder he welcomes the aeroplane so enthusiastically. Below Weheka there is no suitable road giving easy access to a country which yearly is becoming more important as a field of possible industrial development. There are no bridges over great rivers which are often completely impassable. Only the air service can be relied on to keep reliable and regular touch with the hundreds of settlers, prospectors and labourers who are working this new country. Even clergymen are taking advantage of the air travel facilities to keep in touch with these isolated units of their flocks. On Monday Mr Mercer picked up a Roman Catholic priest at Okuru North, and took him back to his centre at Wataroa. The priest said that the air service saved him weeks of travel. He was formerly used to packhorses to get him into the country at the far end of Westland and has had experiences of rough travelling which have made him a pioneer too. The air service has played another vitally important part in the development of South Westland. This is undoubtedly a country of unsurpassed commercial possibilities —cattle, sheep, timber, gold, other minerals of value in extensive deposits, fishing grounds which are said to be the best in New Zealand. can all be exploited there in the future. Hitherto, because of the difficulties of access, not only has development been impossible, but there has been a lack of knowledge of these possibilities which has led to a lack of interest in the country. This, it seems, is being overcome by the easy access offered by the aeroplane, and it seems certain that a good deal of the quickened interest in the south, and the actual development which is now under way, is due to the new ability to see the country and assess for the first time its potentialities. For instance, since the service from Hokitika started and interested authorities have been given a unique chance to survey the almost limitless timber resources of the Haast and the country south, there have been definite signs of a greatly increased interest in the possibilities of opening up mills there. Already two such projects are under way. But the best proof of the anxiety of South Westland residents to benefit from the pioneering of Air Travel (NZ), Ltd., is the manner in which they have co-operated with the company in constructing landing grounds. Wherever possible, it seems, the settlers in the most isolated parts have assisted. Some have their own private landing grounds. They have levelled off large areas of their own land and gone to some considerable personal expense. It is possible for the aeroplane to land at more than one homestead almost at -the door. At the tine home of Mr and Mrs A. Cron, of the Haast, the mail is delivered at the back door. Further south, at Okuru North, the aeroplane lands on a large well made private ground—there will soon be splendid runways for all weather there—and the mail can be thrown from the cockpit on to the verandah of the Post Office." After 60 years of struggling for themselves in depressing isolation, the settlers look on the air service as the key to a new existence. They say so and only one knowing what their isolation has been and what the aeroplane is doing could appreciate what a tragedy it would be for them to lose the service. 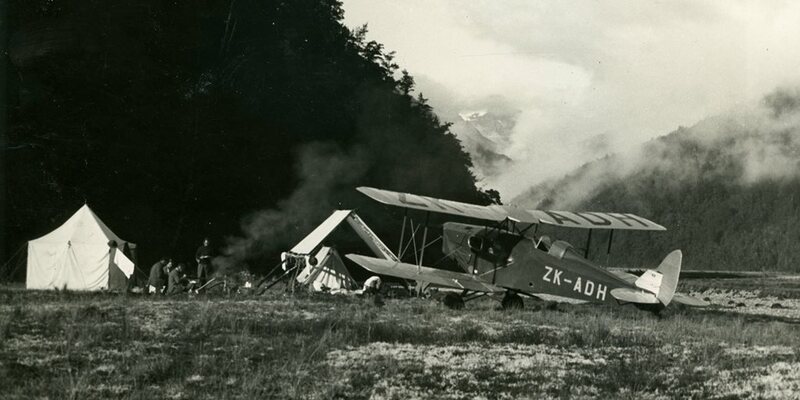 A mishap hit the company on the 8th of February 1935 when the Fox Moth was taking off from Weheka (Fox Glacier). The pilot, Mr J. C. Mercer, was taking off for Hokitika when some cattle rushed towards the machine from the outskirts of the landing ground. The machine collided with a bullock and was immediately overturned. There were two passengers in the aeroplane, one of whom was Mr F J Conradson, Public Works officer for South Westland. Mr Conradson suffered a cut on the scalp and a bruised jaw. The other passenger received slight cuts. Captain Mercer was shaken but unhurt. The aeroplane was considerably damaged, the undercarriage and one wing being bent and the propeller broken. It was taken to Hokitika for repairs. The Canterbury Aero Club’s Fox Moth, ZK-ADH (c/n 4085) was quickly hired to ensure the maintenance of services. In the first three months of operation the business grew rapidly. Captain Mercer, told a Press reporter that the estimates have been proved to be far too low for the existence of the air service has made work that was not dreamed of before. The figures for mail are impressive. When it was taken over the southern stages by packhorse, it used to amount to about 150lb a fortnight. 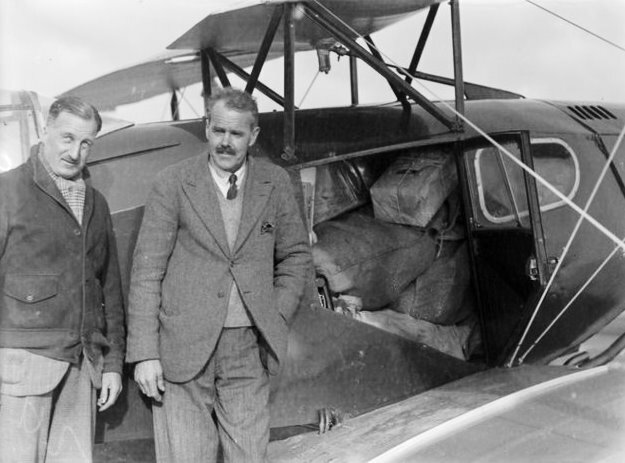 Since the air service began it has grown till a week's load may now be anything up to 300lb… Mr Mercer has flown about 500 hours in the company's Fox Moth and in the Canterbury Aero Club machine which had to be hired in February, and has carried more than 700 passengers. Sometimes the combined load of passengers, mail, and freight for one of the scheduled flights is too great for the machine to handle on the small landing grounds available, and more than one flight has to be made. 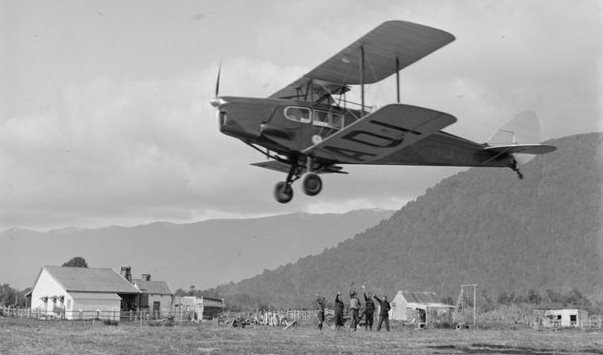 The company's contract with the Post and Telegraph Department calls for only one mail flight a fortnight to Haast, Okuru and Bruce Bay, but at present a flight is made every week. Such a growing business necessitated a second aircraft and so in May 1935 the company ordered a second Fox Moth which had previously been owned by the Prince of Wales. ZK-AEK was to become known as the Royal Fox. In late June 1935 ZK-ADI, was repaired and returned to the company and the Canterbury Aero Club’s Fox Moth ZK-ADH returned to Christchurch. The company’s first year result recorded a loss of £2 8s 9d, a good result after considering £611 had been paid to the Canterbury Aero Club for the hire of its Fox Moth, and after providing £100 for depreciation. The company’s achievements were impressive having been operating for only a little over six months. In the period from the 1st of January 1935 to the 30th of June 1935 48,933 miles were flown, 490 hours flown, 905 passengers, 4858lb of freight and 5368lb of mail were carried. July 1935 was a record month with 1650lb of mail flown. The newspapers of the time reveal the impact the airline made. The Mount Benger Mail reported the story a family moving house. Moving day for a South Westland family has its problems, even over short distances, when there is no good road between the old home and the new and they are some miles apart. 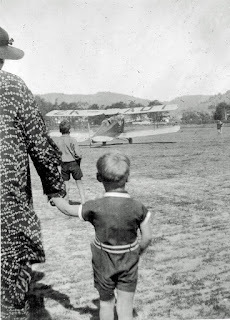 Mr J. C. Mercer landed the Fox Moth of Air Travel (NZ), Ltd., at Bruce Bay recently (reports the Press), and was asked to save a whole family the five hours’ walk from there to Paringa. Two return flights were made, eight minutes each way, and a man, his wife, three children - one of them a baby and their blankets, stores and a box of children’s toys, were installed in a new home. In October 1935 the Royal Fox arrived in Hokitika and was registered ZK-AEK. The following month it had a forced landing on a beach near Haast damaging an elevator. There were no passengers in the machine, and Mr Mercer was uninjured. Then, in early December, it had another forced landing in the Arahura River. This time the undercarriage of the machine was damaged and the propeller split. After these initial setbacks the Royal Fox settled into regular service. With two aircraft in the fleet a second pilot was needed and Squadron-Leader J D Hewett, was engaged. 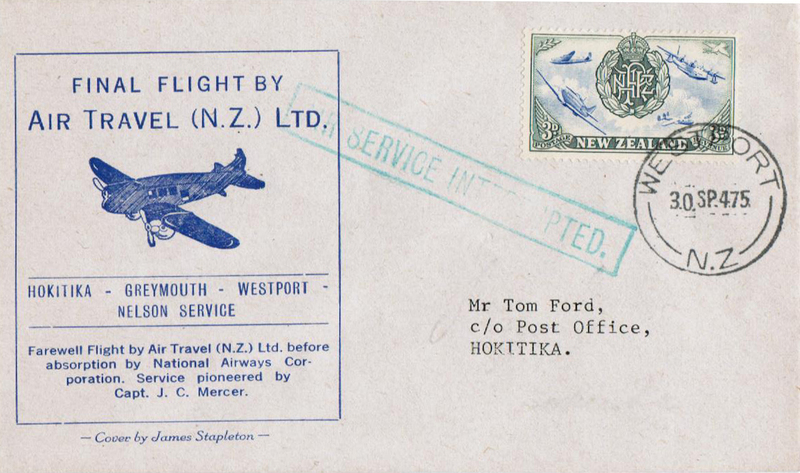 Air Travel (NZ) Ltd’s annual report to the 30th of June 1936 recorded a net profit of £387. Flight numbers were up from 151 flights per month in 1935 to 170 in 1936, 1896lb of mail carried each month (891lb in 1935) 841lbs of freight carried each month (633lb in 1935) and 167 passengers carried each month (145lb in 1935). In mid-1936 the opening of the sawmill at Bruce Bay and the increasing activities of the Public Works Department in South Westland boosted the freight and mail carried by Air Travel (NZ). Most of the stores for the men at Bruce Bay and in the construction camps were carried by air - as mail - and in late August the Fox Moths carried 812lb of parcels and letters on mail day which necessitated two trips by one of the company’s Fox Moths and one by the other. One of the more unusual flights was when surface travel was impossible because of flooded rivers: A party chartered an aeroplane to go to a fancy dress ball at Weheka. On the 3rd of August 1936 the Railways Department introduced a Leyland railcar service from Christchurch to Hokitika to deliver the Christchurch Press. During the day the railcar did two return services from Hokitika to Greymouth and a return Hokitika to Reefton service before returning to Christchurch in the evening. Leyland railcar Rm21 is seen with Air Travel's Fox Moth ZK-AEK at Hokitika's Southside aerodrome on the 15th of September 1936. Also in the photo below is Newman's service car. Despite operating under VFR conditions Air Travel (NZ) managed incredibly well. In November 1936 the Evening Post reported that the efficiency of the commercial services was reduced during the winter months, neither Air Travel (NZ), Ltd., on the West Coast, nor Union Airways, Ltd., being able to maintain their 100 per cent, rating gained last quarter. Air Travel came nearest with a 99.3 per cent., having missed only two of the 309 flights scheduled. By the beginning of December 1936 the loads were well ahead of the previous year. For the whole of 1935 the company made 837 flights, lasting 413 hours, to carry 9421lb of mail, 6450lb of other goods, and 580 passengers. Up to the end of November this year the number of flights made was 2194, lasting 1070 hours. The mail carried was 31,034lb, the goods 11,268lb, and the number of passengers 2,450. May 1936 was a record month with 280 flights flown carrying 373 passengers while November was a record month for mail with 5041lb carried. The year ended with heavy passenger traffic as many Public Works employees left the camps for the Christmas holidays travelling to Hokitika by air and the prospect on tourist flying over the summer. In March 1937, with business increasing, the company announced it was increasing its capital by adding 7000 ordinary shares of £1 each to enable the purchase of a de Havilland DH90 Dragonfly. 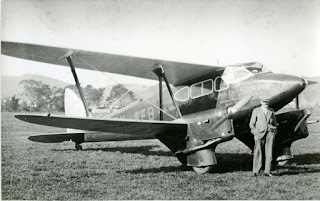 The Evening Post described the Dragonfly as a twin-engined biplane, similar to the de Havilland Dragon Rapides, used by Cook Strait Airways, only slightly smaller. The engines are four cylinder Gipsy Majors of 130 horse-power, giving a top speed of 147 miles an hour, and a cruising speed of about 125 miles an hour. The cruising range with normal fuel load is 885 miles. The aeroplane will hold its height with one engine only running. The cabin has two seats side-by-side in the nose, with dual controls. A single seat is behind, and a seat for two right across the back of the cabin. It is possible for short flights to fit an extra movable seat alongside the single peat, thus giving accommodation for a pilot and five passengers. The machine ordered will have the extra seat fitted, and another extra will be the provision of sliding windows in the cabin. The cabin door is on the port side, and is wide enough for two persons to get out at a time. Behind the cabin is a luggage compartment of 28 cubic feet capacity. Access to this is by a door on the starboard side. The Dragonfly will have full wireless equipment enabling communication either by Morse code or by direct speech through wireless telephones. The Dragonfly will be the most modern machine in service in the South Island, and with its quick take-off and short landing run, will be well suited for the South Westland service. Reporting on the 30th of June 1937 year-end report Bert Mercer said that the Two aeroplanes operating on the West Coast have carried more than 830 tons of cargo, including passengers, livestock, mail, and goods, in two and a half years… An air service is usually accepted as one carrying passengers and mail, and occasionally a few parcels. During the 12 months which ended on June 30 this company's two machines have carried pigs, dogs, cats, fowls, sheep, ducks, machinery, gold, bicycles, and go-carts… In the two and a half years of operation Air Travel has carried 5810 passengers, and the number of flights was 5942. Allowing one pilot for each flight, and accepting 15 average persons as weighing a ton, the human cargo weighed more than 783 tons. The mail and goods carried in the same period weighed more than 49 tons. De Havilland DH90A Dragonfly ZK-AFB arrived at Lyttleton on board the Port Huon on the 16th of September 1937. It was transported over Evans Pass for assembly at Wigram by the managing director of the company, Mr J C Mercer, the company’s ground engineer, Mr A O Templeton, and the Wigram staff and was flown to Hokitika on the 29th. 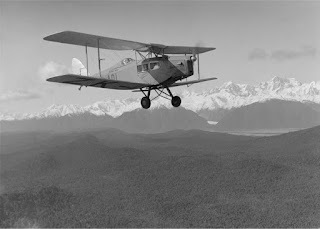 On the 24th of February 1937 Cook Strait Airways commenced a thrice weekly Nelson-Greymouth-Hokitika service which connected at Hokitika to Air Travel (NZ)’s service to and from the glaciers. Cook Strait Airways’ new service proved particularly popular with northbound passengers who were able to fly right through to Wellington. The southbound service, which originated in Nelson, was not as well patronised as passengers from Wellington either had to fly over the previous afternoon or cross Cook Strait by the overnight ferry to Nelson. Responding to this need, from the 1st of October 1937 the Cook Strait Airways’ service was retimed to run Wellington-Nelson-Greymouth-Hokitika and return three days a week. Air Travel (NZ) adopted a new timetable enabling passengers from Wellington to fly to Franz Josef or Fox Glaciers and South Westland in a single day. The Air Travel (NZ) connection to the Glaciers didn’t produce a huge amount of traffic, the first passenger availing himself of the new service being Mr J L Squire, of Union Airways. From Wellington to Franz Josef the trip took three and a half hours, compared with three days by boat and service car! He returned to Wellington in the same way. Air Travel (NZ) had high hopes that this would generate more business with connections available to and from Wellington even Auckland but these hopes did not come to fruition. In May 1938 the company announced its intention to apply to operate an air taxi service from Westport. At this stage the present Carter’s Beach airport was not in operation and Westport’s airfield was on the other side of the Buller River at North Beach. Bert Mercer and Paul Renton visited Westport on the 25th of May to promote the service. A twice weekly air taxi service started in early July with Bert Mercer predicting that the service would be extended to daily calls. Later in the month the Press reported that an early delivery of “The Press” was made to men employed on the new aerodrome near Carter’s Beach. Westport, yesterday morning, when Mr J C Mercer, piloting an Air Travel (NZ), Ltd., machine, flew low over the ground and placed the papers almost at the feet of the workmen. For the year ending the 30th of June 1938 Air Travel (NZ) made a net profit of £984. With passenger numbers, freight and mail loads increasing the company placed an order for a second de Havilland Dragonfly. It arrived in Wellington on 29th of October 1938 on board the Rangitiki. It was assembled at Rongotai with newspaper coverage reporting that it was specially equipped for the tourist traffic, and some of the windows in the cabin will open, enabling photographs to be taken without difficulty. 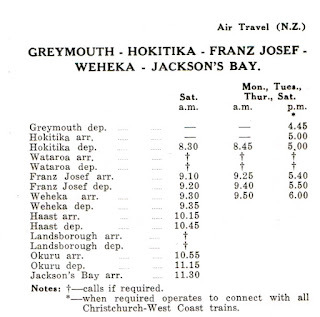 It was delivered to Hokitika in November 1938. The whole fleet of three Fox Moth and two Dragonflies on the 24th of November. The Press of the 24th of May 1939 described an ambulance flight to South Westland and the dedication of the Air Travel (NZ) pilots. How air transport has broken down isolation in far South Westland and minimised the difficulties of life there was well demonstrated today, when Mr J. C. Mercer, of Air Travel (NZ), Ltd., received an urgent call in the early morning to fly down to Okuru, many miles south of Hokitika, and bring back to hospital a resident, Mr P. O'Neill, who had a seriously poisoned leg. The weather was absolutely against flying, and in normal circumstances the flight could not have been undertaken; but the aeroplane was taken down in the worst of weather, since it was the only means of the sick man getting relief, and he was brought out. There are no roads from Okuru leading out into the settlements further north, and with all the rivers seriously flooded, it is likely that Mr O’Neill would have to have waited at Okuru possibly so long that even his life might have been in danger. As it was, he was in Hokitika before dark this evening and receiving relief. Conditions were extremely bad for flying all day, with heavy, squally rain, fog and generally bad visibility but the long trip from Hokitika to Okuru and back was made without mishap. Air Travel (NZ) Ltd made a loss of £753 in the year ended June 30, 1939. The directors reported that repairs and maintenance of machines were heavy with two engines being practically rebuilt. Finances were seriously affected as the company failed to obtain revision of the mail contract rates. 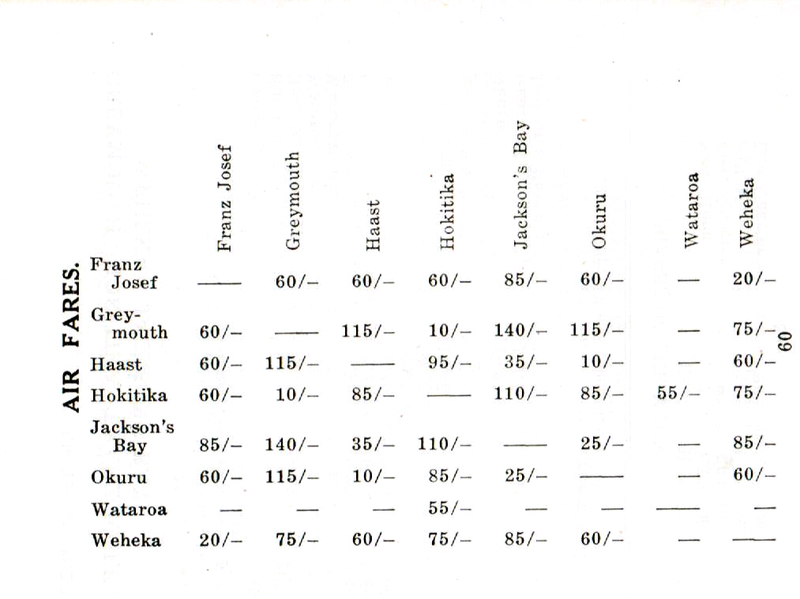 On the Hokitika-Jackson's Bay run the mails carried increased by 23 per cent but the remuneration was only 6.9 per cent more. Some 78,777lb of mail were carried, compared with 63,838lb in the previous year. Fewer scenic flights were made because of adverse weather. In all 4325 passengers were carried on 4224 flights occupying 1954 flying hours. In the company’s first four and a half years of operations its machines carried 15,570 passengers, 223,230lb of mail, and 80,243lb of freight. On the 1st of September 1939 Germany invaded Poland and two days later New Zealand was at war. This was to have a major impact on Air Travel (NZ). In November 1939 the Government commandeered Cook Strait Airways’ de Havilland Dragon Rapides. As the Government considered Air Travel (NZ)’s operation a national service its aircraft were not commandeered. Negotiations with Cook Strait Airways enabling Air Travel (NZ) to take over the West Coast-Nelson service for as long as the company was able during the war. Cook Strait Airways’ last flight operated on the 9th of November 1939 with Air Travel (NZ) beginning their Monday to Saturday service on the 10th of November. The schedule saw a company Dragonflies departing Hokitika at 9.45am and fly via Greymouth and Westport to arrive at Nelson at 12.30pm to connect with a flight to Wellington. The return service left again at 1.00pm, reaching Hokitika at 3.45pm. Bert Mercer told the Press, A slight increase in fares is very likely. They will go up by probably 5s, because our machines have not the same seating capacity as those operated by Cook Strait Airways. 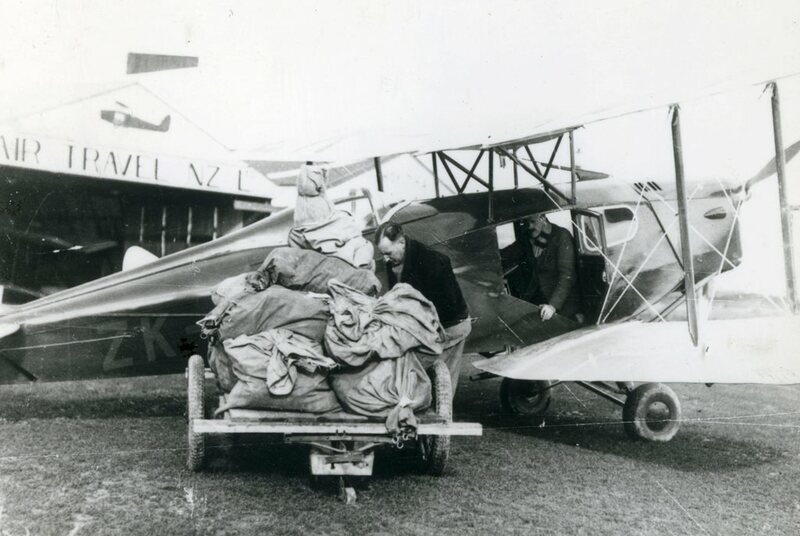 Air Travel (NZ) often carried unusual freight. On the 30th of November 1939 The Press reported on such an air freight flight. A curious cargo carried by aeroplane last week from Greymouth to Wellington was a consignment of live mountain trout. The fish were caught on the West Coast, and are to be shown in the aquarium of the Centennial Exhibition. Three times on the flight from Westport, the water in which the trout were carried was, changed. The first change was made at Westport, the second at Nelson, and the third at Blenheim. Between the stopping places, Mr J. C Mercer, the pilot for Air Travel (NZ), Ltd., fed the fish, which arrived in Wellington in excellent condition. No other air service in New Zealand carries a more miscellaneous freight. Whitebait by the hundredweight is transported by the Hokitika aeroplanes from South Westland in the season, and, as the aeroplanes are the only means of quick delivery to the inaccessible places of Westland, they are frequently called on to carry some quaint cargoes. The strangest to date was the body of a man who had died in a southern camp, and, which was carried to the railhead for shipping to the North Island for interment. A calf, a pig. and half a ton of wire rope are among other unusual items carried on the aeroplanes. With Cook Strait Airways out of the air and a reduction in the Union Airways’ fleet Air Travel (NZ) were called on to help with additional Cook Strait flights. After Christmas 1939 a Dragonfly made special trips between Wellington and Nelson. This was the first of many special flights across Cook Strait. Fox Moth ZK-AEK had a mishap at Jackson’s Bay on the 3rd of February 1940. The pilot, Mr Neave, was taxiing to a standstill when a strong gust of wind caught the machine, and caused it to skid to one side. The aeroplane struck a log, and damaged one wing. The two tips of the propeller were broken, and part of the undercarriage was also damaged. There were two passengers and mail on board at the time, but the passengers did not know that anything unusual had happened until after the machine had stopped. With no road access the damaged aircraft had to be brought back to Hokitika by the MV Gael. 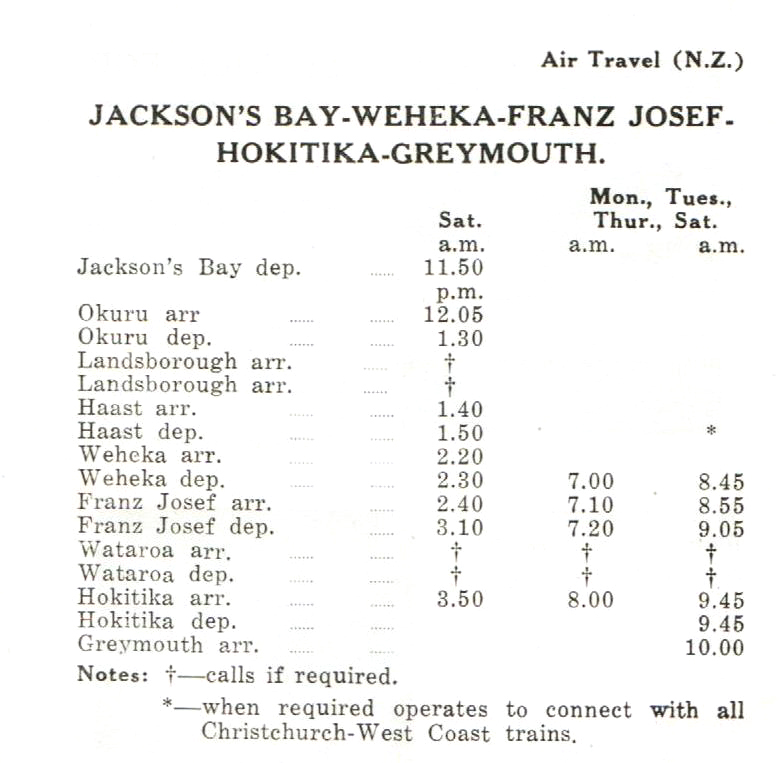 On the 4th of May 1940 Air Travel (NZ) cut the Hokitika-Greymouth-Westport connection due to heavy operating costs and mounting losses. Air Travel (NZ)'s South Westland service continued as did the service between Nelson and Westport. 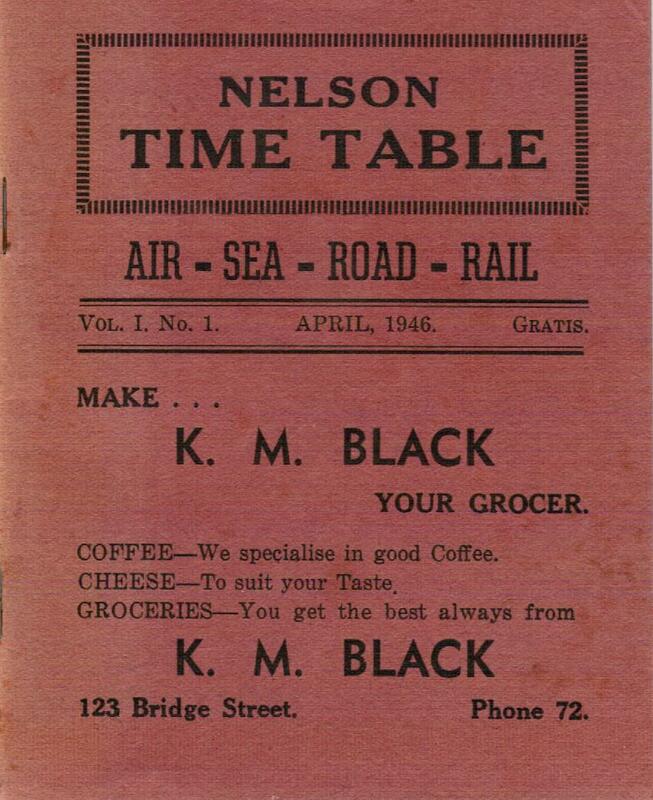 A new schedule for the Nelson to Westport service was announced which saw an aircraft based at Nelson. This left Nelson at 8.35am after the arrival of the Wellington plane and arrived at Westport at 9.40am. The return service left Westport at 11.15am arriving at Nelson at 12.20pm connecting with the Wellington flight. 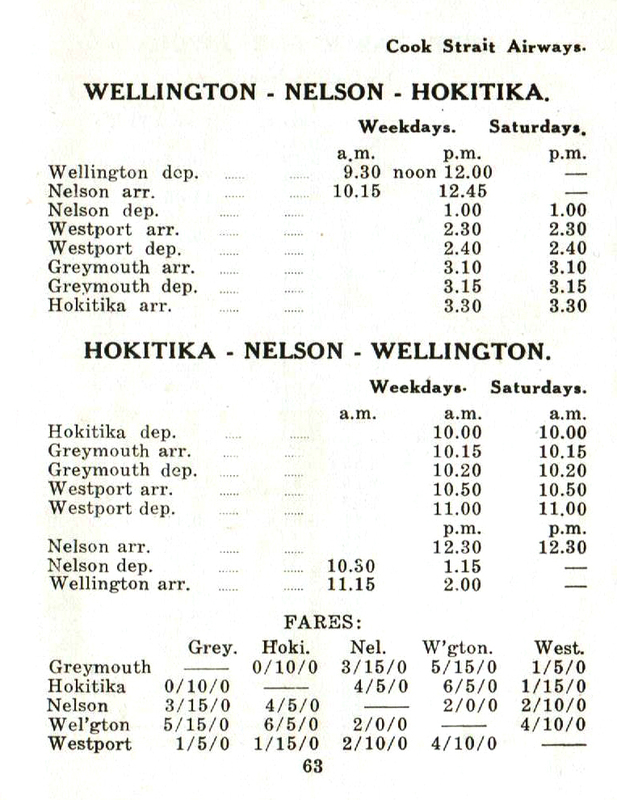 A new schedule to operate between Nelson and Westport is announced. The aeroplanes will in future remain overnight at Nelson, leaving there at 8.35 a.m. on the arrival of the Wellington aeroplane and arriving at Westport at 9.40 a.m. On return to Nelson, the aeroplane will leave Westport at 11.15 a.m., arriving at Nelson at 12.20 p.m., connecting with the aeroplane for Wellington. Another feature of the War-time was patrols of the fiords and southern coast for the RNZAF. These were operated by the company’s de Havilland Dragonfly aircraft. Finally, on the 6th of September 1944 and after Bert Mercer’s death, The Press was able to recount this valuable work. One essential war service in New Zealand of which nothing has yet been told commenced in 1939. This was the air patrol of the West Coast, the south-west sounds and Stewart Island. In those days, when every strange ship was suspect, the scenic value of the sounds in particular was overlooked and their potential strategic importance became apparent. These sheltered, deep-water coves could provide ideal cover for ships of all sizes. Some sort of patrol was called for, and the only type that could be carried out quickly and accurately was an air patrol. However, the comparatively few aircraft of the RNZAF. capable of carrying out a long distance patrol were urgently needed elsewhere. The firm of Air Travel (NZ) Ltd., was already running an air service down the West Coast. In addition, their chief pilot, the late Mr J. C. Mercer, who held the rank of flight lieutenant in the Air Force Reserve, knew every inch of the. territory. One of the firm’s aircraft was incorporated in the RNZAF and Mr Mercer instructed to carry out patrols. At first these were spasmodic, usually at the request of the Navy, but later, particularly during the reign of the German raiders, they became regular sights. The patrols were long and lonely affairs over some of the roughest country in New Zealand and with the weather seldom favourable. With gusty, changeable winds and patches of rain, low-flying searches up the narrow, cliff-bound sounds could become tricky jobs and Mr Mercer pointed out in one of his earliest reports that a thorough inspection of the sounds could only be carried out in perfect weather. On that particular occasion, the veteran pilot had been in the air for the greater part of one day and half the next, making two searches of Stewart Island after a rumour that a ship had been sighted in Port Adventure. The weather in the vicinity of the sounds he described laconically as “filthy.” Time after time Mr Mercer was forced to turn back on account of weather, but on each occasion the patrol was resumed as soon as conditions showed signs of clearing. The difficulty of the patrol was increased by the fact that it was not possible to fly across from the head of one sound to the next as each arm was cut off by sheer cliffs running up to four and five thousand feet. Some of the following extracts from some of Mr Mercer’s earlier reports give interesting sidelights on the nature of the patrol, and. incidentally, of the nature of the pilot who did so much for commercial aviation in the Dominion; ‘‘Left Hokitika at 5.45 a.m. to patrol sounds. On reaching Haast the weather began to close in. After refuelling, proceeded south as far as Big Bay where I was compelled to return on account of weather being unfavourable. Returned to Hokitika, picking up a corpse at Jackson’s Bay on the way back…” “...At south end of Stewart Island I flew south for 100 miles and then returned to Invercargill. Owing to stormy conditions could not enter sounds. Decided to go to Taieri so that machine could be housed for the night...” “… Went down as far as Blight Sound, but conditions were hopeless owing to heavy rains and thick mist in sounds... Rainfall in the sounds area for the month has been approximately 20 inches…” “...As it was snowing in the rest of the sounds I made for Stewart Island…” “…Saw 12 wapiti on shores of lake at head of Bradshaw Sound…” “...Dropped paper to Dog Island Lighthouse...” As it happened, no enemy ships were ever sighted by the south-west sounds patrol. Whether or not enemy ships ever were in the area, it is certain that the patrol was carried out as conscientiously as was humanly possible. Flights were often made when normal safety precautions would have dictated that the aircraft turn back, arid the long low level searches among such mountainous country were always tiring to the pilot. The company’s financial result to the year ending 30 June 1940 yielded a net profit of £1297. The financial report noted Receipts for scenic flights at the glaciers were further reduced because of the war, and during the first months of the financial year, the same tendency was apparent in the returns from the South Westland service. When, therefore, the Government took over the aeroplanes and equipment of Cook Strait Airways. Ltd., the directors closely investigated the matter and decided to accept an offer by that company to allow Air Travel to operate the service between Hokitika and Nelson its licence. 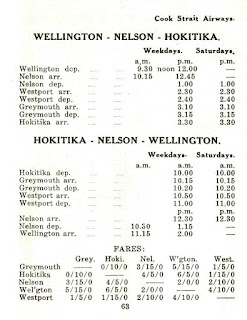 The new, service was commenced in November in order to test its possibilities, but in May it was found necessary to curtail this service, and aeroplanes are now only operating between Nelson and Westport. 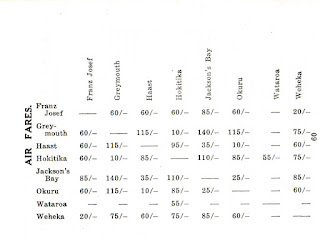 During the exhibition a considerable amount of business was obtained from the overflow traffic from the Cook Strait service between Wellington, Nelson and Blenheim, and this traffic was largely responsible for the increased earnings shown for the year. As these earnings were due almost entirely to the exhibition traffic, it is unlikely that will be repeated. During the war years there was little reporting on the company’s activities. A further profit of £1377 was made the following year to the 30th of June 1941, with decreases reported in flying hours, passenger numbers and mail carried. The decreases were attributed to the difficult conditions brought about by the war. In late 1941 Bert Mercer was honoured by a function in Hokitika to mark his attainment of 10,000 flying hours. James Cuthbert (Bert) Mercer was born in Dunedin in 1887 and he made his first flight as a passenger in a tethered balloon in Invercargill. A mechanic by trade, he ran a garage in Waikari before the First World War. In May 1917 Henry Wigram started the Canterbury Aviation Company to train pilots for the War. Bert Mercer joined initially as a mechanic but soon after arriving and with only three hours' flying Mercer went solo. His natural skills as a pilot saw him appointed as a flight instructor until the end of the War. After the War he took up a post as chief pilot to the New Zealand Aero Transport Company which operated from Timaru. Although daily services were planned between both islands, these ambitions were never realised, and after a year or so the company went into liquidation. Captain Mercer then returned to being a mechanic. He attended the wartime pilot refresher courses held at Wigram and when the Canterbury Aero Club was formed in 1928 he again entered active flying life as an instructor. It was after receiving an invitation to visit one of his pupils on the West Coast that he saw the possibilities of an air service to South Westland. 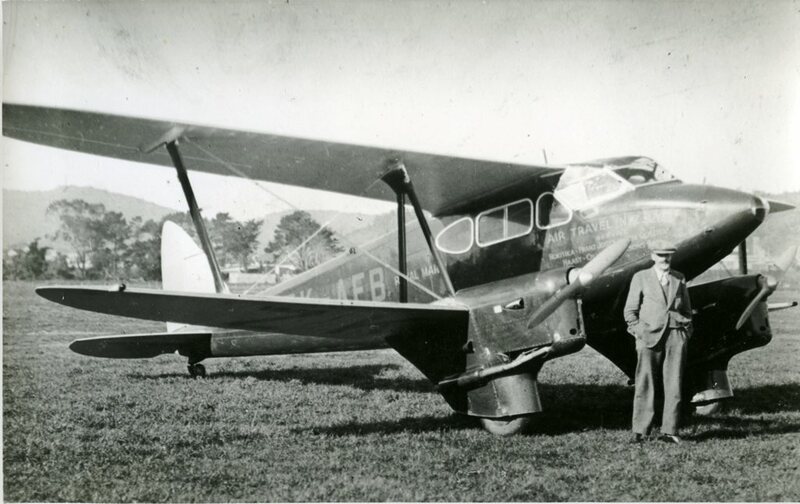 Using the Canterbury Aero Club’s aircraft he made many flights to South Westland. 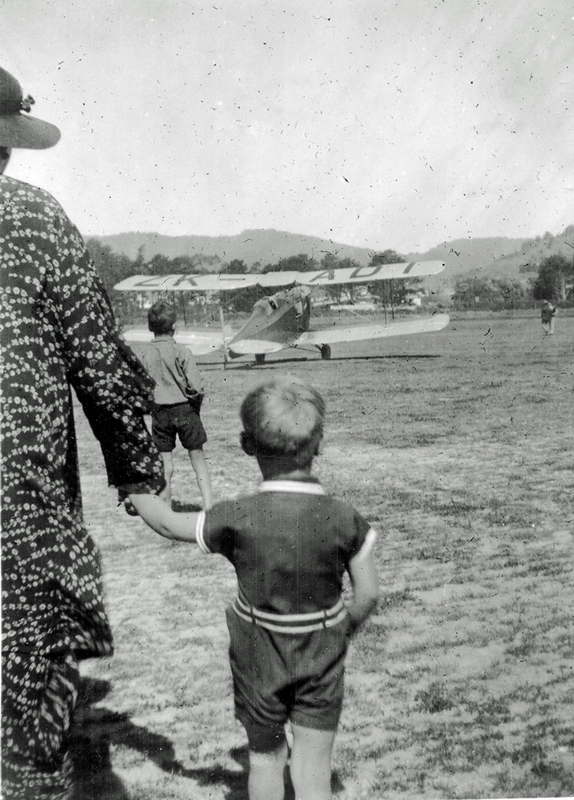 The residents, seeing the advantages the aircraft brought, were more than happy in building landing grounds, well before Air Travel (NZ) started in 1934. With such a rich involvement in aviation it was right that he was honoured by a representative attendance of Government, local body, civil, and Royal New Zealand Air Force officials. Settlers from as far south as Okuru were amongst the guests. Every speaker praised him as both a man and an aviator. Captain Mercer was described as a grand pioneer in the development of South Westland and a saver of many lives by providing an air service under difficulties. Although he had landed on river beds, beaches, and paddocks. His only fatality in 10,000 hours of flying was one cow. One positive aspect of the War was the development of the Haast aerodrome in 1941. The airfield was on the homestead property of Mr J. Cron. The original runway prepared by Mr Alan Cron was only 220 yards in length. By December 1941 the Public Works Department had built a modern aerodrome with wide runways of 1250 yards in all directions. The heavy machines used in the construction were transported to the Haast in scows, A strip of bush to the east of the homestead had to be felled to give a clear run-in. One of the Dragonflies had a mishap at Bruce Bay on the 11th of January 1942. As it landed on the beach after its flight from Hokitika the aircraft suddenly slewed, causing the undercarriage to collapse on one side. The pilot and his five passengers were unhurt but the aircraft had to be taken to pieces and transported to Hokitika by road. The damage was not extensive. Despite the war conditions the financial year to the 30th of June 1942 was again successful with a £496 profit. By the end of August 1942 the air service from Hokitika and Greymouth to Westport and Wellington had resumed. The resumption of the air service was not recorded in national newspapers but the Press of the 28th of August reported that the Air Travel (NZ) aeroplane on its way from Hokitika to Nelson yesterday was forced to turn back at Karangi because of the rain, sleet, and high wind. Today the aeroplane did not call at Greymouth because of the windy conditions at the aerodrome. This morning Greymouth passengers for the north joined the aeroplane at Hokitika. Tragedy struck Air Travel on the 21st of December 1942. De Havilland DH90 Dragonfly ZK-AGP, piloted by Flight Lieutenant A. C. Baines left Hokitika for Westport at 8.25am with three passengers on board. After picking up an additional passenger it departed Westport about 9.30am bound for Nelson. Twenty minutes later a radio message was received stating that one engine had stopped and the plane was endeavouring to return to Westport. A second message stated that a propeller was missing. The aircraft gradually lost height and a third radio message was sent saying, "Will attempt landing in the sea." The aircraft ditched approximately seven miles north-east of the Westport Harbour bar and four miles offshore at about 9.50am. The impact caused the aircraft’s nose to dip into the sea and the tail to lift. On board were four passengers, Messrs Albert Johnson from Hokitika, A. Walters from Haast, Michael Hearty from Haast and George McBride of Ngakawau. At the time visibility was very bad. The pilot and three passengers successfully evacuated the aircraft but unfortunately Albert Johnson was unable to do so. The aeroplane remained afloat for about 20 minutes with passengers standing on the wings. It then sank, taking Johnson with it. Messrs. Walters and Hearty were together in sea though neither could swim and Walters in panic kept pulling Hearty under the water. George McBride too had difficulty swimming. After a time both McBride and Walter disappeared. Meanwhile the Union Steam Ship collier Kakapo, which had just departed Westport, diverted to the crash site and arrived 20 to 30 minutes after the plane sank. Baines and Hearty were taken aboard the steamer but Hearty died soon after. The pilot escaped with minor injuries and shock. Sergeant Holt of the Westport Police had been informed of the accident and joined the harbourmaster Captain Tointon in the Harbour Board’s launch. Mr Alf Thompson was also notified and quickly put to sea in his fishing launch. Both made a widespread search, but could see nothing of the aeroplane or survivors, so returned to port. In the meantime the ship had rescued the two survivors. The harbourmaster was informed of the position and again put out to sea in the Harbour Board’s launch. Some five miles north of Westport he found the rescuing steamer, and after great difficulty, because of the rolling of the sea, got the pilot and Hearty aboard, the latter in one of the stretchers from the steamer. At the Board of Inquiry held in late January 1943 Orville Darcy Openshaw, the ground engineer for Air Travel gave evidence of his inspection of the plane, and said there was nothing visible that would indicate any possibility of fault or trouble developing. The Air Department was represented by Dr N A Foden. He told the Board that, It was common knowledge that one of the propellers of the twin-engines on the aeroplane flew off, when the aeroplane was at a considerable height. The substantial point at issue was the flying off of the propeller, which led to the disaster. The main points for consideration involved the speculation as to why the propeller flew off, the failure of the aircraft to maintain height with the one engine which remained, and the loss of life which might, or might not, have been connected with the absence of life-saving equipment on the aeroplane. There were three possibilities as to the cause of the propeller flying off, without causing any undue vibration, the first two certainly without, and the third probably with at least some vibration; (a) complete and sudden fracture of the crankshaft at or in the immediate vicinity of the propeller hub; (b) failure of the locking device on the propeller hub, allowing the hub to pull straight off the splines on the crankshaft; (c) a shear of all, bolts retaining, the propeller on the hub. If the craft were salvaged, or the propeller discovered, said witness, much clearer light would be thrown on the mishap. In his evidence Flight Lieutenant Baines, said there was no warning before the propeller came off. He was just breaking through the clouds at about 4000, when he saw the propeller 10 to 20 feet in front of the aeroplane. He then steered towards the land and decided to descend to a lower level. He had hopes of striking land near Granity, and then thought it would be wiser to land just off Westport in the sea where launches would be more readily available. At 400 feet the aircraft appeared to be maintaining height, while the speed was being maintained at full throttle. In the early stages he had hopes of making the land, and that the machine would maintain height. He had had experience of single-engined flying. Witness said he was able to devote all attention to his instruments, even though he felt a great deal of anxiety for his passengers during the final few minutes. He kept well out to sea because of the close proximity of the hills. He did this for safety reasons in climbing through the clouds. He still thought he could make land, even after seeing the vessel which steamed to their rescue. He attempted to make land, as he realised he had no lifesaving apparatus. When the aeroplane struck the sea it nosed into the water immediately. When witness came to his senses, he got through a jagged hole in the fuselage, after which three other passengers came up. He heard the passenger, Johnson, singing out inside, but as the door was submerged, he could not go to his assistance. On the 4th of March 1943 the Dragonfly’s sheered propeller was found on a beach near Patea in the North Island. An examination of the propeller suggested that either the bolts had sheared or the nuts had come off. Squadron Leader E. F. Carpenter, senior aircraft inspector, told the Board of Inquiry that examination of the propeller indicated that certain of the holding bolts had been loose, and in his opinion any looseness that existed had been over a period—not a short period, but a fairly long period. There was a bare possibility that the bolts might fail, in spite of locked tight nuts, but that was a very remote possibility in the particular case. Assuming that the propeller had belonged to the machine ZK-AGP, he did not think that the "50-hour check" had been carried out efficiently in that respect. The most probable hypotheses to his mind were: First and most probable, the slackness of at least three of the nuts, and perhaps four, and the consequent failure in flight of the tight bolts, or, second, that at least three of the bolts were of sub-standard material, which he thought was doubtful. The final report was issued in July 1943 apportioning the blame to the Aircraft Engineer Openshaw. Dealing with reasons and responsibility for the propeller coming adrift, the board says that a 50-hour check job sheet was signed by Openshaw and certified, inter alia, that the starboard airscrew was examined and checked for tightness. The board says: "That a slackening of the bolts did develop we have no doubt, and we are satisfied it was progressive over a period of time, extending beyond the period of five hours five minutes flying time between this last check and the time of the accident. No evidence was presented to us that climatic conditions had any effect on, the particular type of propeller involved in this accident, which the standard procedure and check, if properly carried out, would not remedy. "We are of opinion that the only feasible inference to be drawn from the evidence placed before us is that the check certified to by Openshaw on December 19, 1942, was not properly carried out in that the bolts securing the propeller were not then tightened, resulting in looseness and the ultimate loss of the propeller in flight. "We recommend that such licence or authority held by Openshaw to sign out aircraft be cancelled. "As to the regulations concerning the carrying of lifebelts, this is not obligatory where an aircraft is operating at sea within 10 miles of the nearest land. The licensed route of Air Travel from Hokitika to Nelson would not in the ordinary course of flight take the aircraft more than 10 miles from land. The existing regulation was modelled on the British air navigation regulations." The board pointed out, however, that owing to the rough nature of our coast lines aircraft on a coastal route in New Zealand could not land on the greater part of the coast. This meant in event of a forced landing coming down on the water. Mainly for this reason it strongly recommended that a lifebelt be carried for each person on board where any coastal or sea route was followed, and that instructions as to their location, fitting, and use, be clearly displayed in the cabin of each aircraft affected. 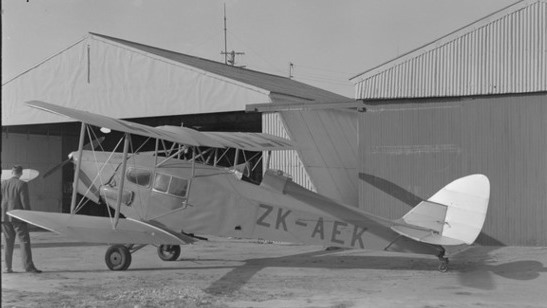 During the time of the Board of Inquiry the RNZAF impressed Air Travel’s first Fox Moth ZK-ADI into service with the Air Force where it became NZ566. Following the war it was used by the NZ Forest Service for fire patrols. The company experienced another major accident on the 29th of October 1943. De Havilland Fox Moth ZK-AEK carrying a pilot and four women passengers on a sight-seeing flight over the Franz Josef Glacier made a remarkable forced landing on an ice plateau half a mile below the Aylmer Glacier. The cause of the accident was a sudden down-draught over the glacier which forced the emergency landing. The plane was piloted by Mr. Orville Darcy Openshaw, and his passengers, all members of the Women's Auxiliary Air Force, were Mrs N J Ward (Whangarei), Miss Molly Wilson (Morrinsville), Miss Margaret Cornwall (Cambridge) and Miss Clare McQuitty (Dunedin). Leaving the Waiho aerodrome at 9.30am, the plane set out on a short flight of approximately a quarter of an hour. When it did not return within half an hour the office of Air Travel (NZ). Limited, was notified at Hokitika and immediately got in touch with the principal, Captain J C Mercer, who was piloting one of the company's service planes on the Nelson-Wellington route. Captain Mercer turned back, and, following a brief reconnaissance of the ice field on the glacier, sighted the missing plane at 2.45pm lying in a normal way. Captain Mercer said the plane was half a mile below the Aylmer Glacier on the left-hand side and about 300 or 400 yards from the shore and a quarter way in on the ice. The two left wings were crumpled, but the right wings appeared to be undamaged. The fuselage also appeared to be undamaged, but the engine had broken away from the machine. There was intense relief just before seven o'clock last night when Captain Mercer returned to Waiho with the news that all four passengers and the pilot were safe and apparently not seriously injured. A further reconnaissance flight was carried out during the late afternoon and it was a little after 6.30 that the five people were seen on a large rock on the mountain side just beside the glacier. All five were waving their coats and were standing up, walking about and apparently uninjured. The forced landing on the glacier will probably go down in history as the first of its kind in New Zealand at least. When the discovery of the party was made from the air, the first rescue party of five, which had left early in the afternoon, was less than half an hour away from them. A rescue party brought the survivors down the Glacier the following day. The aircraft was damaged, not so much by the severity of the landing as by blocks of ice on the glacier which caught the lower left-hand wing. The landing was made heading up the glacier, and that was inclined to throw the machine on its nose, with the result that the front of the engine was pulled out. The girls suffered no injury, but the pilot was thrown forward against the front of the cockpit and received a severe bump on the head. They were stranded, without any possibility of reaching the Waiho Hotel before nightfall, and Openshaw led the party across the glacier to the mountain side. To get off the ice they had to climb a rock ridge 200 feet high. It was a ticklish job, but the girls entered into the spirit of the adventure, and under the pilot's instruction managed the climb successfully. Five of the first rescue party reached them up on the rise at 9p., and realising that they would have to spend the night there, they all made themselves as comfortable as possible. Some blankets had been brought, and with the assistance of a camp cooker they had hot milk and brandy with sandwiches for supper. It was bitterly cold, but the girls kept up their spirits by singing songs round a fire. The party left at 5am, and shortly after they had reached the glacier they met the second relief party, which had spent the night at the Defiance hut. In the meantime, Captain J C Mercer, director of Air Travel (NZ), Ltd., had arranged air transport back to Hokitika for Openshaw, and there he received attention for injury to his forehead, which was not serious. The aircraft is a complete loss. Although the damage is not heavy, it would be impossible to transport it down the glacier. To replace it today would cost £2500 to £3000. A few days later, however, and the decision was made to salvage the Fox Moth. The salvage was performed by a party of 15 in eight days. All were experienced mountaineers and they slept in mountain huts near the scene of the accident. Following the aircraft over the many deep crevasses during the three-mile journey the men constructed a wooden sledge. Many hazards were met in bringing the half-ton aeroplane over the ice from a height of 5000 ft., but the salvage was accomplished without mishap. The total cost was about £300, of which £60 was spent in feeding the members of the party. The aircraft was then sent to the de Havilland factory at Rongotai for rebuilding. AEK’s accident left Air Travel with only one Dragonfly and one Fox Moth which meant reduced services were flown. With the loss of the Dragonfly and a Fox Moth out of action the company acquired de Havilland DH84 Dragon ZK-AHT. The Dragon had previously operated East Coast Airways’ service between Gisborne and Napier before being impressed into the RNZAF. Pilot Officer J D Neave flew the Dragon to Hokitika on the 23rd of March 1944 and it was put to work on the Hokitika-Nelson route. Newspaper coverage at the time also reported that, Another eight-seater aeroplane, powered by two Gipsy Six engines, each of 205 horse-power, has been purchased in England by Air Travel (NZ) and the company expects to have it in commission before the end of this year. The company hoped the Dominie would arrive by the end of the year but this never happened. 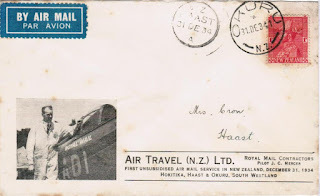 Air Travel (NZ) celebrated its tenth anniversary of operations on the 22nd of May 1944 with the Hon. 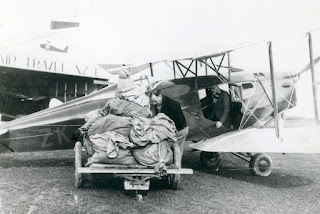 James O’Brien (Minister of Transport and Member of Parliament for Westland) opening new administrative offices and waiting-rooms at the Southside Aerodrome. A large crowd of residents and visitors gathered for the occasion. In 1951 the building was moved to Hokitika’s new Seaview Airport where it served as the terminal building until 1979. Disaster struck the company the following month. At 1.00pm on the 30th of June the Dragon under the command of Flight Lieutenant P. C. Lewis left Nelson on its way south to Westport. The trip to Westport was expected to take 1 hour 20 minutes, and petrol was carried for just over two hours. Flying weather was good on the Nelson side of the mountains, but there were isolated showers on the West Coast side. After 1 hour 50 minutes, when the plane had still not reached Westport, the fact that it was overdue was reported to Central Flying Control, Wellington, by the duty pilot at Nelson. Steps were immediately taken to, organise a search. By that time the weather had deteriorated towards the West Coast, and over Marlborough conditions were so bad that no planes could be sent out. The first news of, the missing plane was received in Nelson at 11 o'clock last night from Mr. Arthur Hughes, a transport driver on the Nelson-West Coast run. He telephoned from Gowan Bridge to say that he had picked up one of the passengers, Mr. Perry, near Kawatiri. The plane had crashed in bush on the slopes of Mount Hope, about one and a half miles from the main Nelson-West Coast road. The pilot, Flight Lieutenant Lewis, had walked with Mr. Perry from the scene of the crash to within 150 yards of the road, where he collapsed as a result of injuries. The police at Murchison were advised and a search party was organised. When the search party reached the wreck they found that Mr. Dawe had been killed and that Captain Mercer had died from his injuries an hour and a half before their arrival. Matron Patterson, although suffering herself from a broken leg, had given first aid to the remainder of the party. The search party, accompanied by the ambulance from Murchison, included Dr. Kurzweil, of Murchison, and Sister Owen, sister in charge of the Murchison Hospital. Another ambulance was sent out from the Nelson Public Hospital at about the same time. Dr. R. D. Lucas, of Nelson, and Constables Valentine and Squires accompanied this ambulance. In the meantime Mr. Hughes, the transport driver, and Mr. P. Diserens, of Gowan Bridge, had returned to Kawatiri to locate Flight Lieutenant Lewis, and they had him on the roadside when the party from, Murchison arrived.. He was treated by Dr. Kurzweil and sent by ambulance to the Nelson Public Hospital, arriving there at about 4 o'clock this morning. Maurice Dawe, Hokitika, secretary of Air Travel, Ltd.; killed. Captain J. C. Mercer, Hokitika, managing director of Air Travel, Ltd.; died of injuries. Mrs. E. Russell, Westport, both legs broken; condition serious. G. M. Strathmore, Wellington, believed fractured skull; condition satisfactory. Miss A. Patterson, matron of the Buller Public Hospital, Westport, broken leg. Flight Lieut. P. C. Lewis, the pilot, head, chest, and leg injuries. B. R. Perry, Wellington, shock, fractured rib; condition satisfactory. Dr. Lucas said that from what he could see in the dark and the pouring rain the pilot had made as good a landing as possible on a bush-covered ridge about four or five miles on the Nelson side of Kawatiri. The plane had crashed near a small creek, which Mr. Perry and Flight Lieutenant Lewis, had followed down to the main road. The bush was thick and the path very rough, and although Dr. Lucas reached Kawatiri at 1 o'clock this morning it was 3.15 by the time he reached the plane. Rain was falling, and with only electric torches to help them the rescue party had a very difficult task. Apart from relieving the pain of the injured, who were suffering from the cold, with morphia little could be done in the way of first aid. The two injured women and Mr Strathmore were, tied to stretchers, and with six men to each the difficult task of bringing them down the rough mountain slope was commenced. It was 7.15 o'clock this morning when the party reached the road. The injured persons were brought on to the Nelson Public Hospital by ambulance, arriving shortly after 10 o'clock. Dr. Lucas .paid a tribute this morning to Miss Patterson, matron of the Buller Hospital, for her work in caring for the injured. She obtained morphia from the plane's first-aid kit and gave what relief she could to the other passengers. The hospital reported that none of the five injured was in any immediate danger. Arrangements were made by the Nelson police to bring the bodies to Nelson today. The party will have a difficult task as the country in the Kawatiri district is rough and bush clad, with heavy undergrowth. The track to be traversed winds up a rocky creek bed and many obstacles will have to be overcome by the stretcher-bearers. More details later came to pass. It appears that the Air Travel (NZ) plane crashed on the slopes of Mount Hope about three-quarters of an hour after it had left Nelson aerodrome. Till then the trip had been pleasant, and, though light rain was met over Glenhope, visibility remained good. The passengers had no warning that anything was amiss till the plane banked steeply and suddenly dropped into the bush on the hillside… Initial reports said, Due to a cause yet undetermined, one of the engines failed. After a consultation, with the late Captain Mercer Flight-Lieutenant Lewis decided to make a forced landing- The country below was mountainous and covered with patches of bush. Visibility was bad, owing to mist and rain, but as the machine was rapidly losing height pot luck had to be taken. In spite of the odds, it is stated that the manoeuvre was skilfully performed and that the pilot showed great courage and resource. Mr B R Perry recounted that the plane was suspended in big trees, which covered the ridge, but the fuselage sagged down through thick undergrowth almost to the ground. Apparently the nose had been smashed off, and the passengers were thrown about 30ft down the hillside through this hole. After he regained consciousness, about 4 o'clock, he had a discussion with the pilot about their position, and it was decided that two of them should try to find their way to the road. Darkness was falling in the bush when they started off at about five o'clock, and the men found it necessary to stop and. rest every two or three minutes. Flight-Lieutenant Lewis, who was in a very bad way, struggled on in the darkness for just on five hours, the last stages in pouring rain, but when only 200 yds short of the main Nelson-West Coast road he was unable to carry on. It was about 10 o'clock when he reached the road. Mr. Perry continued, and he had been walking for only five or ten minutes when he met a truck driven by Mr. Arthur Hughes, of Nelson. Mr. Hughes took him on to Gowan Bridge, and notified the police at Murchison and Nelson of the whereabouts of the crashed plane. Meanwhile, at the crash site, rain started to fall early in the evening and continued heavily throughout the night. Conditions were bitterly cold and the rain seemed to be blowing right into their faces. There was no food or drink and the hours dragged slowly by with hope of rescue in the immediate future seeming very slight. It was 1.30 o'clock on Saturday morning when the calls of the rescue party from Murchison were first heard. Guided by a- series of calls from Mrs. Russell and Miss Patterson, they were able to locate the injured, but in the thick bush it was half an hour before they were able to reach them. The injured were given injections of morphia by Dr. Kurzweil, who accompanied the rescuers, and were warmed with drinks of hot coffee and cocoa. Little could be done for the injured in the way of first aid. They were strapped to stretchers, and the arduous journey to the road commenced through the thick undergrowth and down the rough creek bed. The going was hard, and it was four hours before the party reached the road. Miss Patterson paid a tribute to the work of the rescuers. She said that they were very lucky to have been brought out as quickly, as the cold and the rain were so terrible that none of them could have lived long if help had not arrived. In October 1944 the Board of Inquiry into the accident found that the accident was not contributed to or related in any way to fuel supply, engine failure or structural defect in the aircraft, but that it arose through the aircraft getting in an uncontrolled position and a condition from which the pilot was unable to recover before impacting the forest. The pilot had attempted to cross the saddle at a low altitude over rough, broken country in order to avoid turbulent air conditions below the cloud base, but in the board's opinion the condition in which the aircraft subsequently found itself could have been avoided by maintaining as much altitude as possible while crossing the saddle. Failure to adopt this course contributed substantially to the accident and was, in the board's view, an error of judgment by the pilot. Reference was made to clauses in the Air Navigation Regulations, 1933, providing for installation in passenger-carrying aircraft of radio equipment, but due to wartime priorities the company had been unable to procure the necessary equipment, and the board considered that Air Travel (NZ), Ltd., had taken every reasonable step in an effort to meet the requirements of the regulations. The loss of the Dragon again caused the cessation of the Nelson-Hokitika service leaving Air Travel only operating the South Westland service while it looked for another aircraft. De Havilland DH89A Dragon Rapide ZK-AHS was subsequently released from the RNZAF and purchased by Air Travel (NZ). The aircraft was no stranger to Hokitika as prior to the War it operated for Cook Strait Airways as ZK-AGT, Neptune, before being impressed into the Air Force as NZ558. It arrived at Hokitika on the 2nd of December 1944. ZK-AHS, under the command of Mr P. C. Lewis, and resumed the Hokitika-Greymouth-Westport-Nelson service on the 11th of December 1944. No passengers were carried from Hokitika on its first flight, but one joined the aeroplane at Greymouth. Two pounds of letter mail was carried from Hokitika. With the end of the War the Government reviewed the future of domestic air services. The Government announced that air services within New Zealand were to be owned and operated by the Government and the New Zealand National Airways Act 1945 established a single domestic airline known as the New Zealand National Airways Corporation. On the 1st of April 1947 NZNAC took over the operation of Union Airways and Cook Strait Airways’ services. 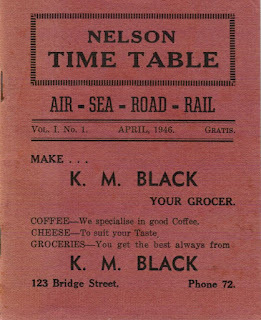 Air Travel (NZ)'s timetable, April 1946. 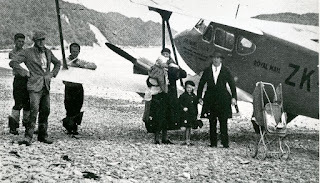 Cook Strait Airways' Nelson-Hokitika service was operated by Air Travel (NZ). For the next six months Air Travel (N.Z) remained as an independent airline. At the beginning of 1947 Air Travel (NZ) were operating scheduled flights between Hokitika and Nelson, Monday to Saturday, on behalf of Cook Strait Airways and their own Monday to Saturday service between Hokitika and Weheka and a twice-weekly service from Hokitika to Okuru. 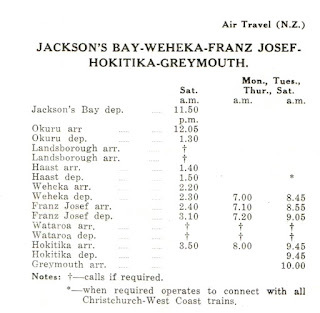 Air Travel (NZ)’s flights to Jackson's Bay had ended on the 31st of December 1945 after the airfield was closed. However, the end was night. With £20,000 paid for the company Air Travel (NZ) ceased its airline services on the 30th of September 1947. 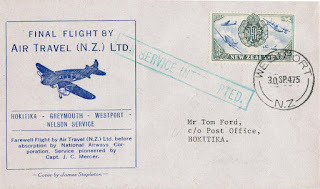 The Air Mail Society of New Zealand details the last Air Travel (NZ) flights. The 30th of September was set down as the date for the last flights by Air Travel (NZ) from Hokitika to Greymouth, Westport, Nelson and return. Normally two trips would have been made in each direction. 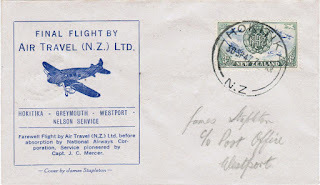 The last air mail from Hokitika to Westport and Nelson, closed at 9.00am on the 30th and was flown right through to schedule by D.H. Dragon Rapide. The plane returned to Hokitika but no mail was carried. The afternoon flight from Hokitika picked up mails at Greymouth but only proceeded as far as Westport, where, because of bad weather, the plane had to stay overnight. 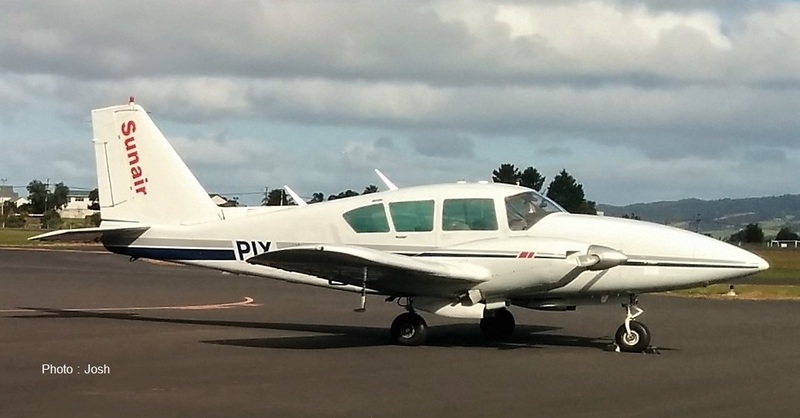 The Air Travel plane which had been grounded overnight at Westport, returned early next morning to Hokitika, carrying the Westport-Hokitika and Westport-Greymouth mails. It is interesting to note that the Northbound mail out of Greymouth on the afternoon of the 30th, was the last to be flown from Greymouth for almost a year as NAC who took over the service, deleted Greymouth from the route. So ended the dynamic story of Air Travel (NZ) New Zealand’s first airline. Want to fly in a Convair?? ?